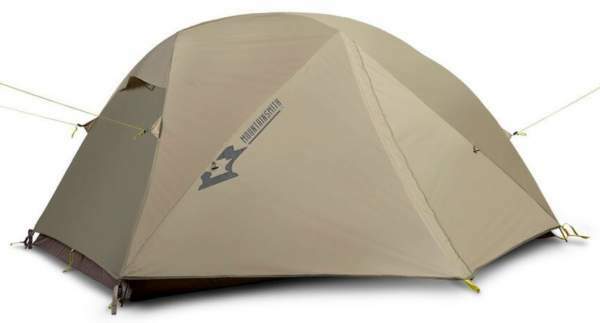 Mountainsmith Vasquez Peak 3 person tent with footprint is a very reliable and versatile 3-season tent, light enough to be carried on the trail but quite small for its declared capacity. The Vasquez Peak 3 tent with closed vestibule. 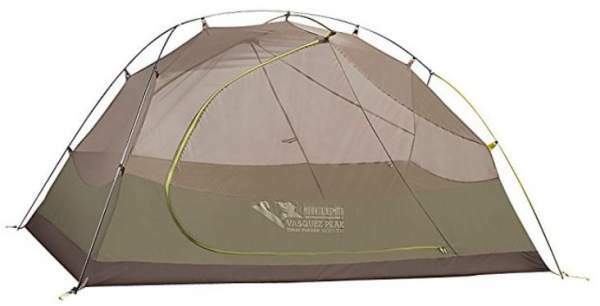 This Vasquez Peak tent is a part of the new series from this brand that includes also a 2-person tent. This is a very simple dome style tent but with a full coverage fly for complete protection from elements. 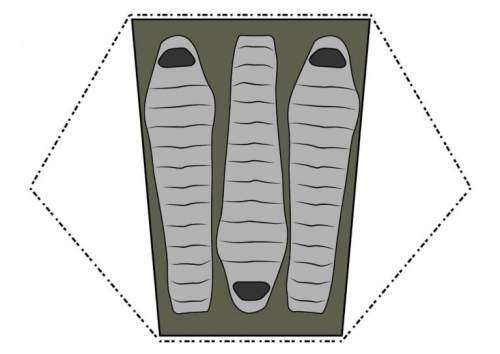 So this is a double-layer structure with the inner tent plus the fly. The tent is also semi-freestanding, this means that it has two vestibules that must be staked to the ground to be fully functional. 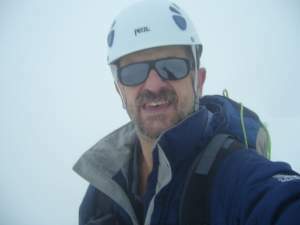 By the way, the tent is named after the Vasquez Peak 12947 ft (3946 m) in Colorado’s Front Range. Capacity-wise, I must say I am confused when I see a statement like “roomy tent”, you can see it in the description by the brand itself. In fact, this tent is smaller than any other I remember from this capacity range. But let’s see the numbers. You have the inner area of 36 ft² (3.34 m²), and this means 12 ft² (1.1 m²) per person if used by 3 people. In my view, this tent is for maximum two people. Vasquez Peak 3 person tent – floor plan. Seasons-wise, well this is quite a different story. 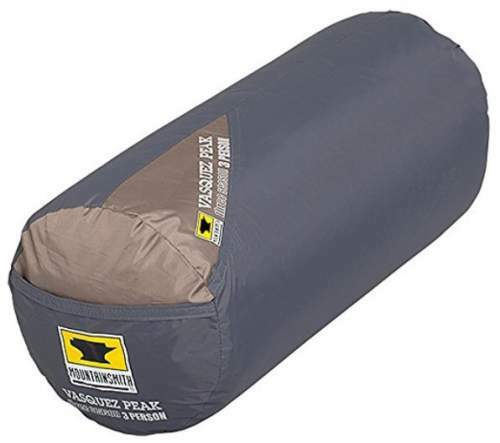 The tent is with a full-coverage fly and with an impressive waterproof rating. The poles are high-quality aluminum pieces, so this is a tent for any weather situation in a 3-season use. Climate-wise, the tent is with lots of mesh. The inner body is all mesh in the upper sections. So this tent is not the best choice for a cold weather. Use it in a warmer environment. Weight-wise, without the footprint it weighs only 5 lb 4 oz (2.5 kg) so it is lightweight but this is not the lightest option if you think about carrying it on the trail, there are lighter tents for such a purpose. But it is indeed light enough to be carried if the weight is shared among the users. So this is a versatile and multi-purpose tent. You have an interesting design with the poles. This is essentially a single shock-corded piece with two hub elements. So the two ends are Y-shaped and the structure is completely freestanding as soon as you put the ends into the corner grommets, see the picture. There is also one shorter brow pole that they add to pull the walls with doors up make them completely vertical. It is also pre-attached to the main pole. This is a 7000 series aluminum alloy. The stakes are included and these are V-shaped, 7075 aluminum alloy. These are multipurpose stakes and they work well in various types of the ground. The tent without the fly. The materials are moderate regarding the durability. So the fly is 40D x 185T silicon poly ripstop F/R. Surprisingly, they do not give the official waterproofness rating for the fly. All that you can find is the statement of ‘best-in-class waterproofing’. I would like to see numbers. The tent’s body is the same material as the fly, plus a No-See-Um mesh. The floor is bathtub type and the material is stronger 68D x 190T poly with 5000 mm PU coating, F/R. The included footprint add extra protection in every sense, this is 68D x 190T poly with 4000 mm PU coating, F/R. All seams on the tent are taped. The carry bag shown below is a 68D poly ripstop. The upper tent body is all mesh so this alone should give lots of ventilation. But the fly is also with two vents to help the vertical flow when the vestibules are closed, so you should not have any major issues with condensation with such a design. This is done properly. The tent allows for a fast fly set-up, see the picture below, you just leave the inner tent and use the footprint with the rest of the stuff. There are several interior mesh storage pockets. Reflective guylines with tension lock cord adjustment. Reflective highlights for all stake out points. Fast-fly setup with the help of the footprint. No waterproof rating for the fly. Why? Packed weight with footprint: 6 lb 6 oz (2.89 kg). Weight without footprint: 5 lb 4 oz (2.5 kg). Fast fly weight without inner tent: 3 lb 12 oz (1.7 kg). Dimensions: 90.5 x 68 in (230 x 173 cm). Inner area: 36 ft² (3.34 m²). Inner area per person: 12 ft² (1.1 m²). Peak height: 48 in (122 cm). Packed size: 19 x 9 in (48 x 23 cm). Vestibules area: 19 ft² (1.77 m²). Total area: 55 ft² (5.1 m²). *This is the weight without the footprint as appropriate for the comparison. 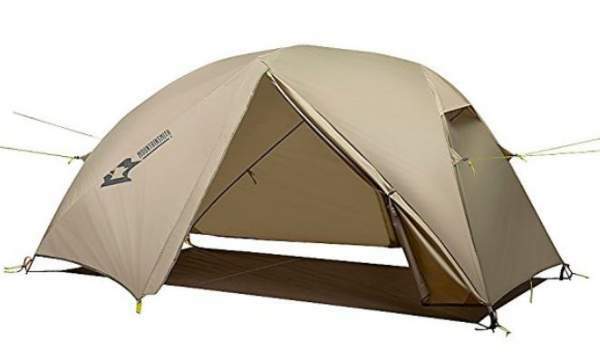 In summary, this Mountainsmith Vasquez Peak 3 Person Tent With Footprint is indeed a very reliable tent built from quality materials, and the price is very reasonable for the value. The size is not so great, and I dislike the fact that they do not give the rating for the fly. Sent them an email and have been waiting for the answer. If you need to see more options, please visit my page with tents, you will definitely find something for you. There is a comment box below so please use it in the case of comments or questions. Have a nice day.